No, Megyn Kelly, Jesus Was Not “White” | No, Megyn Kelly, Jesus Was Not “White” – The Republic of T.
So, this is Christmas. And Fox News host “Megyn” Kelly is determined to have a “White Christmas.” Kelly set the internet ablaze when she insisted that the two biggest names of the season — Santa Claus and Jesus — are absolutely white. My fellow blogger, Bill Sher, has already shown that Santa can indeed sometimes be black, with no ill effects on children. So, Ms. Kelly’s reassurance to any children that Santa is “really” white wasunnecessary. That is, unless she just intended to reassure children that “white Santa” wasn’t on any “no fly lists,” wasn’t going to be deported, and would make it past the neighborhood watch. Now, allow me to shatter Ms. Kelly’s remaining alabaster Christmas tree ornament. Fox News host “Megyn” Kelly is determined to have a “White Christmas.” No, Megyn, Jesus was not “white.” In fact, he wasn’t anything that you would recognize as white. We’ve got forensics that come as close as we’ll ever get to proving it. In 2007, during the furor over Cosimo Cavallaro’s chocolate sculpture of Jesus — which was as controversial for being anatomically correct as it was for its primary ingredient —I read that forensic anthropology had been used to determine what Jesus might have looked like. From the first time Christian children settle into Sunday school classrooms, an image of Jesus Christ is etched into their minds. In North America he is most often depicted as being taller than his disciples, lean, with long, flowing, light brown hair, fair skin and light-colored eyes. Familiar though this image may be, it is inherently flawed. A person with these features and physical bearing would have looked very different from everyone else in the region where Jesus lived and ministered. Surely the authors of the Bible would have mentioned so stark a contrast. On the contrary, according to the Gospel of Matthew, when Jesus was arrested in the garden of Gethsemane before the Crucifixion, Judas Iscariot had to indicate to the soldiers whom Jesus was because they could not tell him apart from his disciples. Further clouding the question of what Jesus looked like is the simple fact that nowhere in the New Testament is Jesus described, nor have any drawings of him ever been uncovered. There is the additional problem of having neither a skeleton nor other bodily remains to probe for DNA. In the absence of evidence, our images of Jesus have been left to the imagination of artists. The influences of the artists’ cultures and traditions can be profound, observes Carlos F. Cardoza-Orlandi, associate professor of world Christianity at Columbia Theological Seminary in Atlanta. “While Western imagery is dominant, in other parts of the world he is often shown as black, Arab or Hispanic.” And so the fundamental question remains: What did Jesus look like? An answer has emerged from an exciting new field of science: forensic anthropology. Using methods similar to those police have developed to solve crimes, British scientists, assisted by Israeli archeologists, have re-created what they believe is the most accurate image of the most famous face in human history.There’s also a BBC special about it. I can’t really blame Ms. Kelly. Her earliest image of Jesus was probably similar to mine. I don’t remember how old I was when I came across a dusty, framed image of Jesus while exploring the old things in my grandfather’s house. I remember being impressed by it, because it was a 3D picture that changed when I moved it back and forth. 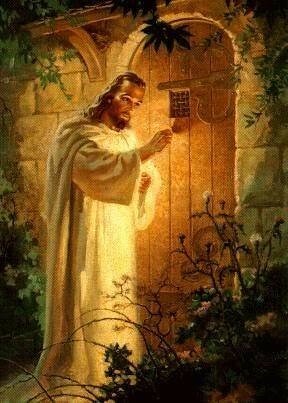 I learned later that it was a reproduction of Christ at Heart’s Door, by Warner E. Sallman. Sallman also painted The Head Of Christ, which is probably the most popular image of Jesus. It’s been reproduced over 500 million times, since Sallman painted it in 1941. If you’re African-American, you may have grown up seeing one of those reproductions hanging on your parents’ or grandparents’ walls — right between John F. Kennedy and Martin Luther King Jr. The first notion that I had that Jesus could be anything other than white (and blonde, and blue-eyed) was around 1974, when the “Black Jesus” episode of Good Times aired. 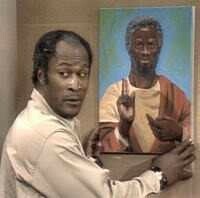 The Evans’ family hung J.J.’s painting of a black Jesus on the wall, and everyone had a sudden run of good luck. It blew my five-year-old mind, at the time. 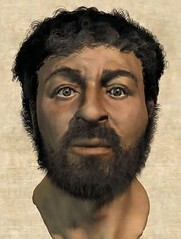 While Megyn Kelly probably grew up images of Jesus looking like someone likely to show up at her family reunion, it was the first time that I even had the notion that Jesus could look like someone likely to show up at my family reunion. That’s probably at the root of both Megyn Kelly’s “White Christmas” outburst, and the Slate post that inspired it. Aisha Harris, the author of the Slate piece, described a conversation that would never have taken place in Megyn Kelly’s house, when Harris’ father explained why Santa was white everywhere else but her house. Seeing two different Santas was bewildering. Eventually I asked my father what Santa really looked like. Was he brown, like us? Or was he really a white guy? In hindsight, I see this explanation as the great Hollywood spec script it really is. (Just picture the past-their-prime actors who could share the role. Robert De Niro! Eddie Murphy! Jackie Chan! I smell a camp classic.) But at the time, I didn’t buy it. I remember feeling slightly ashamed that our black Santa wasn’t the “real thing.” Because when you’re a kid and you’re inundated with the imagery of a pale seasonal visitor—and you notice that even some black families decorate their houses with white Santas—you’re likely to accept the consensus view, despite your parents’ noble intentions.Kelley would never have asked what color Santa was, because it was just understood that Santa was white. (As Kelly emphatically insisted, “He just is.”) The answer is as pat as the unspoken affirmation in the silence that follows it: “Santa Clause is white … just like us.” Harris knew that the black Santa in her house wasn’t the “real thing,” and was “not as good” as the white Santa she saw in her friend’s homes and just about everywhere else. Like the children in the classic “doll experiment” conducted by Kenneth and Mamie Clark between 1939 and 1940, which was cited in Brown v. Board of Education as evidence of how segregation harmed children, Harris prefered the white Santa in the shopping malls and her friend’s homes to the black Santa in her home. Almost 50 years later, a similar study designed by child psychologist and University of Chicago professor Margaret Beale Spencer found that white and black children are still biased towards lighter (white) skin. That’s because, even in the era of a black president and an Indian Miss America, children are still inundated with images and icons that portray the good and powerful as almost exclusively white. It does something to a child to look at the world and see so little of her own reflection in anything; especially anything positive. That’s why African-American parents like Harris’ father have had to serve as an “interpretive wedge,” as Dr. Spencer described. The possibility of that loss of primacy — the feeling of being “primary, preeminent, or more important” than other groups — extending to Christmas, and even to Santa Claus and Jesus, was probably too much for Megyn Kelly (not to mention the Fox News demographic). She needn’t worry. It’s as unlikely that Kelly will have to drive her children around in search of a white Santa or white Jesus, as it is that she’ll have to drive around looking for un-confiscated nativity scenes. But it’s more and more likely that Kelly’s children will come across the occasional non-white Santa, and they may ask Kelly the same thing Harris asked her father. I guess we know what Kelly’s answer will be.